Finnish band called Steve’n’Seagulls plays AC/DC‘s song called Thunderstruck. Brilliant. Covering Iron Maiden‘s The Trooper. Brilliant again. Reminds me of a post I did a while back on a Swedish cover band: Dirty Loops. Lesson by Anita Collins, animation by Sharon Colman Graham, narration by Addison Anderson, music by Peter Gosling. Street musician William Lee plays a perfect rendition of Dire Straits’s “Sultans of Swing” in Sao Paulo, Brazil, where he performs every day. Even though Brazil was eliminated from the World Cup, they still have something to celebrate in William Lee. This is one of the best covers of anything I’ve ever seen or heard. I’m a huge fan of Mark Knopfler and Dire Straights and William Lee really channels them perfectly. MetroGnome has sampled and put together a great remix of iPhone ring and alert tones. Great stuff. Crank it up! Experimental band, Too Many Zooz rocks in the Union Square subway station in New York. This is a brilliant performance and I hope I find them down there sometime. Wow. Alice Herz-Sommer died recently. She was the oldest living pianist and the oldest known Holocaust survivor. This is a beautiful film, made last year. The fact that a Holocuast survivor could say: “every day life is beautiful” is a testament to the human spirit. Milton, Connecticut. Our good friend and neighbor Bill Lauf has a “day” job that pays the bill and keeps him on the road more than he’d like. 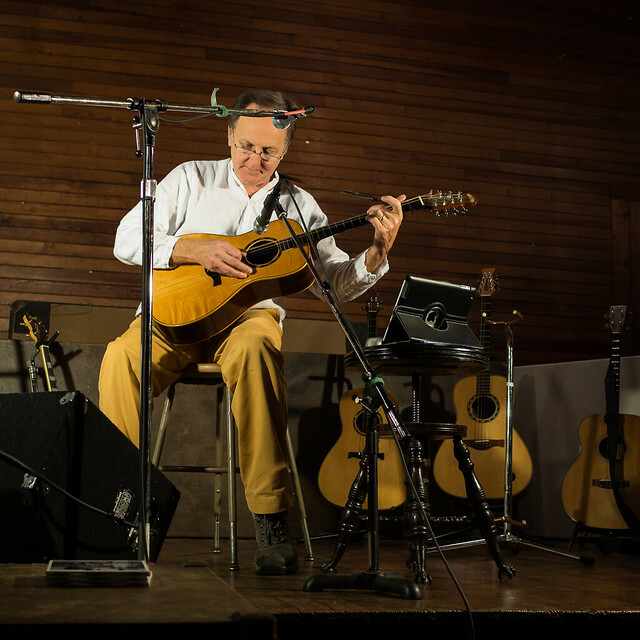 He’s also a fine musician/songwriter and every fall for the past 37 years he’s been doing a concert at Milton Hall, a small gathering place in a small town near Litchfield, Connecticut. My wife Anne was at the very first one in 1976. I didn’t start attending until I met her in 1989 but I’ve been going every year since and Bill has become a good friend of mine. In the past I’ve been tasked with getting some decent shots of Bill playing for album covers and liner note photographs and I’ve brought bags of DSLR gear to this concert. This year I was free but brought the Ricoh GR (my only camera aside from my iPhone) to see what it might do in the tough lighting conditions of Milton Hall. I had to get close (no zoom, 28mm lens) but was able to get a few decent shots where the audio mic wasn’t covering his face. I love this camera, it’s a masterpiece of simple design and high usability, a nearly perfect balance of form and function. There are many things that are great about Bill’s concerts: certainly his music is at the top of the list, it’s superb and he’s continued to grow as both a songwriter and musician over the many years I’ve known him. But, the cast of characters in the audience, some of them our neighbors, some of them familiar faces to us only from this yearly event, is fine as well, and as word spreads about Bill’s concerts more people come and he now has to book the hall for both Friday and Saturday nights. The other “character” that’s in the background but an important part of the mix is Milton Hall and the town of Milton. There’s a reason Bill chooses this venue year after year: the hall has a warmth (heated by a big old wood stove that we had fired up last night) both visually and acoustically that adds character to a folk concert like this and last night there was light snow and it was cold so the place to be was inside the hall, listening to Bill. The PBS show American Masters, ran a fantastic documentary the other day: Jimi Hendrix: Hear My Train A Comin’. You can watch the entire thing online or on the PBS app on an iPad or any iOS device. Even if you think you know all there is to know about the short but amazing life of this rock legend, this documentary will fill in many gaps not to mention, give you a taste of the evolution of his music. I saw The Jimi Hendrix Experience at the Hollywood Bowl in 1968. In those days I saw a lot of bands perform live in both Los Angeles and up in San Francisco but I have to say, Jimi Hendrix was an original and whether you liked or like his music, there’s no denying he was a genius.